The State of Florida’s overall budget does not allot much to the Florida courts’ system (this year, Florida has a budget of $74 billion, but only a tiny fraction of that money goes to the judicial system); most Floridians are aware that the Florida judicial system could use some funding. It wasn’t that long ago when an emergency loan had to be rushed through Tallahassee just to keep things afloat in the Florida courts, remember that headache? 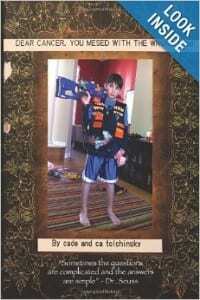 Of course, most fingers pointed to foreclosure lawsuits bottlenecking court dockets – and that’s true. There has been an unprecedented number of foreclosure filings in Florida over the past few years. However, some may assume that foreclosure filings are really the only kind of lawsuits involving real estate that are being filed in Florida courts today by real estate lawyers. That’s not true. 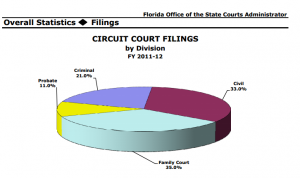 Civil court cases are the most common form of lawsuit being filed in Florida today (see the Office of Court Administrator’s pie chart below); more civil court lawsuits are filed than criminal prosecutions or probate matters. Many of these civil lawsuits involve some kind of real estate controversy. This is not a complete list of issues, as real estate can be involved in many kinds of disputes from divorce to trusts. Unfortunately, real estate litigation is something that occurs much more often than most people think. In recent years, all sorts of new twists have been seen in Florida courthouses around the state involving Florida real estate law. Consider the recent story in Huffington Post about a problem we have here in Florida that is tied to our huge Foreclosure Fraud mess. Lenders are hiring independent contractors to help them maintain and control properties that are subject to foreclosure and are considered abandoned properties by the bank. Apparently, it doesn’t seem to matter to the banks whether or not the they legally hold title to the property, or whether or not the foreclosure lawsuit has been finalized – the banks don’t seem to think these distinctions matter. The contractors hired by the banks, who are not paid high wages, are often doing work without proper knowledge of real estate law: they are there to make sure the home is locked up, the yard is mowed and there aren’t any plumbing leaks. Easy, right? Except these contractors are going into homes where the owners are still living or where they are in the process of moving out. The homeowner may still be living in the home they are fighting to keep because they believe they have a valid defense to a foreclosure lawsuit. All too many times, the result of these bank contractors visiting these homes is that personal property is disappearing — or privacy rights are being violated as home owners are faced with strangers entering their domain – and the contractors claim they have every right to do so – because they have the authority of the big, bad bank behind them. Result? Real estate lawsuits filed in civil courts by homeowners for trespass, invasion of privacy, theft and other causes of action not normally associated with real estate. Just another twist on things. We should assume that before the housing industry crisis and the Florida Foreclosure Fraud mess gets behind us, there’s going to be other twists, too.